Some American Presidents have their faces on currency, some get memorialized in films and sketches. Then there are the others, whose all-but-forgotten names are unceremoniously attached to middle schools and parks across the country. And one of those is the 21st president, Chester A. Arthur. 1. HE WAS DOGGED BY RUMORS THAT HE WAS REALLY CANADIAN. Arthur was born in Fairfield, Vermont in 1829. That’s the official story, at least. Throughout his career, though, there were persistent rumors that Arthur had actually been born in Quebec. Arthur’s father, an Irish immigrant, was a Baptist minister who worked in northern Vermont and had spent time in Canada, and his mother’s family lived in Canada when he was born. The family moved around frequently, which led to claims that Arthur was born not in Vermont, but just north of the border. The rumors exploded into speculation during the election cycle of 1880, when Democratic rivals led by lawyer Arthur Hinman accused Arthur of fudging his American-born bona fides, making him ineligible for the presidency or vice presidency. Arthur never took on these claims in public, and there is no birth certificate record tying him to Vermont. Nevertheless, modern Arthur biographers maintain that there is no truth to the Canadian rumor and that the murmurs were little more than dirty 19th century campaigning. 2. HE HELPED INTEGRATE NEW YORK STREETCARS. Once he completed his studies, the future president worked as an attorney for the law firm Culver, Parker, and Arthur in New York City. In 1854, black schoolteacher Elizabeth Jennings was physically forced out of a whites-only horse-drawn streetcar on her way to the First Colored American Congregational Church. After Jennings refused to leave the car and was manhandled by the conductor and a passing police officer, she sought help from her father, a prominent New York tailor, who contacted Arthur. Arthur and Jennings’ subsequent legal victory affirmed that the Third Avenue Railroad Company was liable for the acts of its agent and that “colored persons, if sober, well-behaved, and free from disease” were allowed to ride. Jennings was awarded $225, the court tacked on an extra 10 percent as well as court costs, and all New York City railroad cars were soon integrated. 3. HE GOT CANNED BY PRESIDENT HAYES BECAUSE OF CORRUPTION. Arthur was named Collector of the Port of New York in 1871 and supervised nearly 1300 agents who collected about 75 percent of the nation’s import duties. The agency ran under a system, called moiety, that allowed officials a percentage of the fines or goods that resulted from smuggled goods they caught, which allowed Arthur to earn roughly an extra $40,000 a year (substantially more than his standard $12,000 a year salary). The reform-minded Rutherford B. Hayes, elected to the White House in 1876, went after the New York Customs Office and the political machine operated by Republican Senator Roscoe Conkling. He set up a commission to investigate the practice of giving jobs to political allies, and Arthur was ultimately ousted in 1878. 4. HE BECAME PRESIDENT AFTER JAMES GARFIELD WAS ASSASSINATED. Despite this setback, Arthur’s political prospects kept improving. In 1880, Arthur was nominated for the vice presidency at the 1880 Republican National Convention thanks to his affiliation with Conkling and the powerful New York Stalwarts. After the Republican ticket took the contest, Arthur quickly had a falling out with the freshly elected Garfield, who attempted to destroy Conkling’s influence in Congress. After Conkling resigned from the Senate, many insiders thought Arthur’s prestige as vice president would dwindle to nothing. But Garfield was shot in the back and killed in July 1881 by 39-year old Charles Guiteau, who’d sought a European consulship and stalked Garfield for weeks before the attack. Some skeptics believed Guiteau was a hired killer in the employ of Conkling and Arthur, but the assassin's claims of friendship and association with the Stalwarts were not true. Arthur later supported many of the civil service reforms he opposed as port collector. 5. ARTHUR LAVISHLY REFURBISHED THE DILAPIDATED WHITE HOUSE. 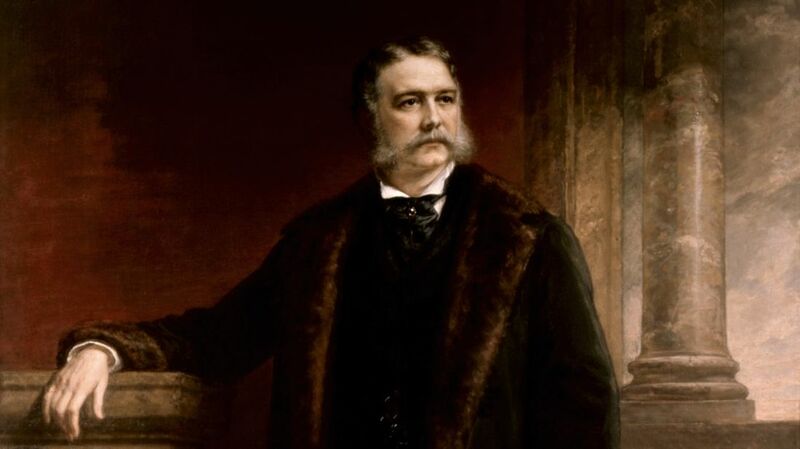 Arthur commissioned massive repairs before settling into the White House, which was called “dingy” and a “permanent cesspool” by the New York Times. Some observers even blamed the poor condition of the home for Garfield’s inability to recover from his wounds. Arthur finally moved into the residence in December 1881, three months after taking the oath of office. Not wanting to spare any expense, Arthur hired Louis Comfort Tiffany to decorate and redesign the residence. As part of the renovation, over $6000 worth of mattresses, mantels, china and cuspidors from the old home were sold at auction, and the Arthur administration eventually spent over $30,000 ($2 million in today’s money) on the project, with the bulk of the money spent on stained glass, lighting fixtures, mantels, mirrors and paintings. A massive 338-square foot mosaic screen adorned in ruby, crimson, white, cobalt and blue opalescent glass was created by Tiffany and placed in the Entrance Hall. It was removed during the 1902 White House renovation, sold at auction to a hotel owner for $275, and then destroyed in a fire. 6. HE OVERTURNED A COURT-MARTIAL RULING AGAINST A BLACK WEST POINT CADET. In 1880, Johnson Whittaker, a cadet from South Carolina, was found unconscious in his room, beaten, partially mutilated and tied to his bed. After a shoddy investigation found that Whitaker had faked the attack to get out of taking an exam, the school superintendent called for an inquiry. Handwriting experts testified that Whittaker himself had penned a threatening note he had received, and he was dismissed from the school. At a trial in 1881, Whittaker was said to have committed the act himself due to his lack of friendships and self-ostracizing nature, and because “Negroes are noted for their ability to sham and feign.” He was found guilty of conduct unbecoming an officer, dishonorably discharged, fined one dollar and sentenced to one year hard labor at a penitentiary. Luckily, David G. Swaim, the Judge Advocate General of the Army, wrote a letter to Secretary of War Robert T. Lincoln informing him that the entire proceeding had been illegal and based on racism, and no evidence had been presented that showed Whittaker had harmed himself. The following March, President Arthur ruled that Whittaker should be released because the court had introduced improper evidence, the trial was invalid and therefore the sentence was void. Lincoln still discharged Whittaker for failing the philosophy exam though (which his supporters dispute). A TV movie based on the story, called Assault at West Point: The Court-Martial of Johnson Whittaker, was released in 1994 and starred Samuel L. Jackson and Sam Waterston. 7. HE WAS CALLED THE "DUDE PRESIDENT" BECAUSE OF HIS LOVE OF FASHION. Arthur’s affinity for light trousers, high hats, frock coats, silken scarves and other high-fashion staples of the day became magnified once he occupied the White House. Political cartoonists and commentators, who referred to him as “Elegant Arthur,” the “Gentleman Boss” and “Dude of all the White House residents,” highlighted the time and money Arthur spent on clothing. Arthur supposedly owned about 80 pairs each of pants and shoes, which came in handy since he switched outfits multiple times a day, including wearing a tuxedo to dinner. He also allegedly tried on 20 pairs of pants made to his measurements before selecting one, spent $125.25 on hats in an eight-month span, and after becoming vice president went on a $700 shopping spree at Brooks Brothers (that would be about $15,000 today). Arthur refused to hire a bodyguard during his presidency, but he did hire a valet who attended to his clothes and personal belongings. 8. HIS SISTER MARY ARTHUR MCELROY SERVED AS WHITE HOUSE HOSTESS. Arthur’s wife Ellen Herndon passed away on Jan. 12, 1880 due to complications from pneumonia. Her sudden and tragic death at the age of 42 came two days after she attended a benefit concert in New York City while her husband was in Albany on state business. After being elected vice president, Arthur asked his sister to take on many of the social duties of the White House and to help care for his daughter, also named Ellen. He never remarried and receded from public life after his only term due to his failing health from Bright’s Disease, a kidney ailment now known as nephritis, a diagnosis he received shortly after becoming president. He died in 1886 at the age of 57.